CHATOUS is convenient, practical, fast and functional. You can access by putting an e-mail, a name and a password .... and you're in! add a new chat - to begin to find new visitors. Of them you'll know their name,the age, where they chat and also what they seek. video chat - if you want to switch to the video chat. 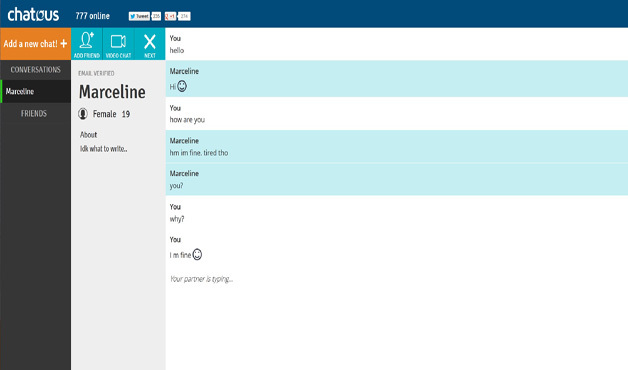 Initially this random chat connects you to another visitor through text chat, and you can decide later if you want to see the person you're chatting with. Comfortable and practical! next - if you want to pass to the next partner. CHATOUS is a new random chat, but also slightly different from the others and is also original. What is the proof of these words? Visitors are always present in many .... girls and boys from all over the world who want to meet people and make new experiences. So what are you waiting for? Did not you say you wanted to know many people from all over the world? Ok so now you know what to do.